Origin and Habitat: Guanajuato, San Luis Potosí, and Queretaro, Mexico. It has a very limited range(extent of occurrence ca 1,000 km2) and is known from only two locations. Altitude range: It occurs at elevations of 750 to 2,200 metres above sea level. It is very likely for the species to be found in Hidalgo. Habitat and Ecology: The species occurs along relatively steep slopes in submontane matorral and deciduous forests. 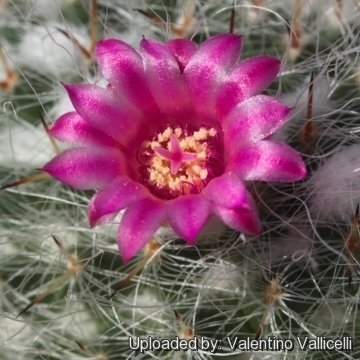 This cactus is locally common where it occurs, and grows in groups/clusters which are generally rare. 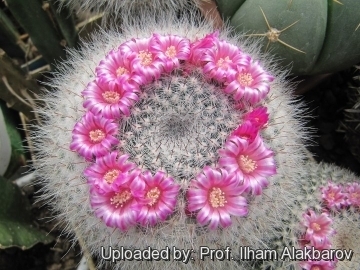 Mammillaria hahniana is listed as near threatened due to is very limited range and because it is affected by illegal collection and some subpopulations are impacted by deforestation. Mammillaria hahniana f. albiflora hort. 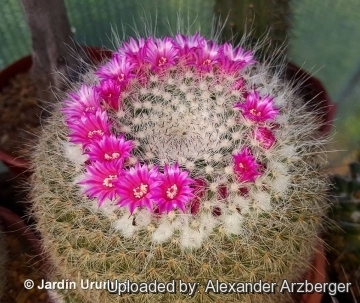 Description: Mammillaria hahniana is a popular sun-loving succulent that forms large groups. It is readily identified by its long, white, thin, flexible hairs which can densely cloak the plant's body and increase in thickness, richness and length in age. This cactus flowers prolifically, even when young, making it a good species to have in a collection. Includes numerous variations and described subspecies, none of which are currently accepted. Stem: At first globular, later cylindrical, light green,or greyish-green up to 9 cm high and 10 cm in diameter. Tubercles: Numerous, small, triangular conical, with latex. Axils: With 20 or more white hair-like bristles, spreading, curly, which can be, short or, on some plants, up to 5 cm long. Central spines: 1-4, white with reddish tips up to 4 mm long. Flowers: M. hahniana produces concentric rings of violet-red to pink about 12-15 mm in diameter. Blooming season: Late winter to spring. Fruits: Club shaped, red, 5-7 mm long. 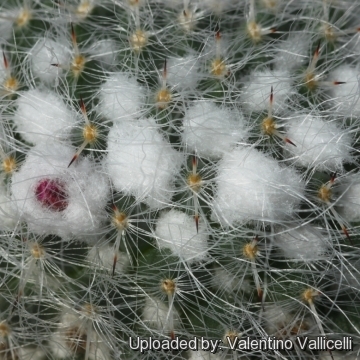 Mammillaria hahniana Werderm. : has 20-30 radials spines, one central spine (rarely more), and purplish red flowers. Distribution: Queretaro, Guanajuato, and Tamaulipas. Mammillaria hahniana f. albiflora hort. : has white flowers. Garden origin. 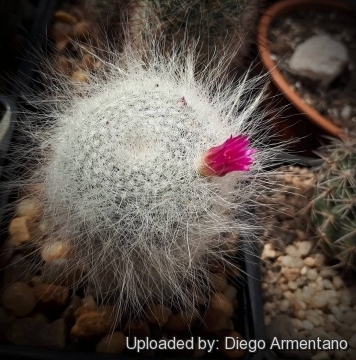 Mammillaria hahniana subs. bravoae (R.T.Craig) D.R.Hunt: has 28-30 radials, usually 2 central and deep pink flowers. Distribution: Rio Blanco region of Guanajuato. Mammillaria hahniana var. giselana W.T.Neale: ha thinner hair less than 15 mm long and has up to 40 radial spines. Distribution: Tarajes, Guanajuato, Mexico. 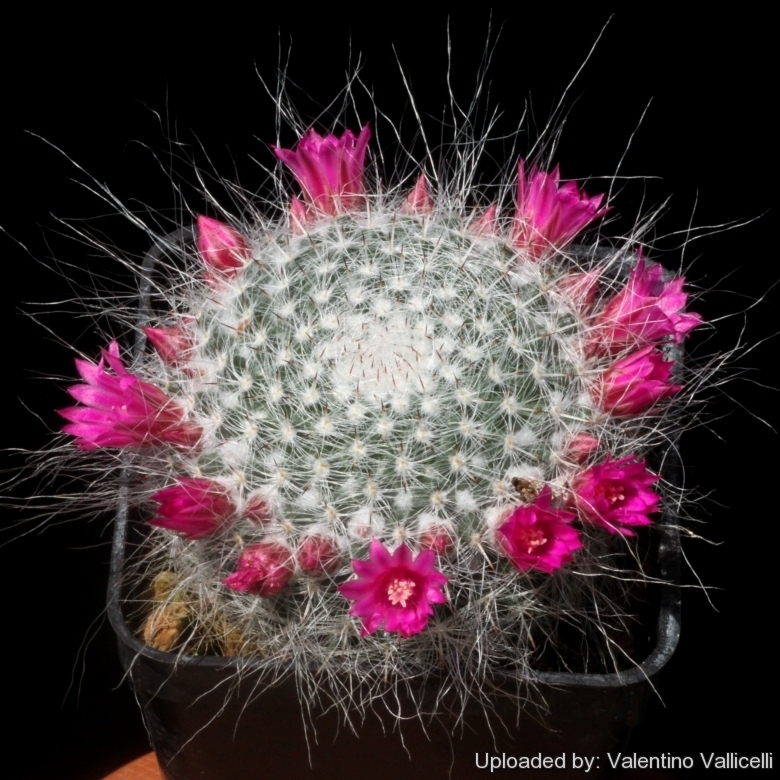 Mammillaria hahniana subs. mendeliana (Bravo) D.R.Hunt: has 2-4 central spines with very reduced or no radials, and pale pink flowers. Distribution: Guanajuato and Queretaro. 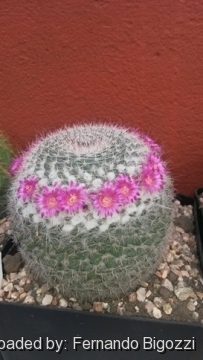 Mammillaria hahniana var. werdermanniana F.Schmoll ex R.T.Craig: has axillary hairs up to 25 mm long, angular tubercles, and outer petals shortly ciliated, stigmas pink-brown. Distribution: Guanajuato, Mexico. 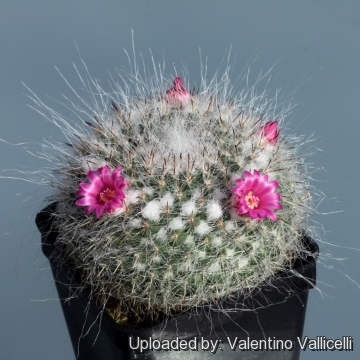 Mammillaria hahniana subs. woodsii (R.T.Craig) D.R.Hunt: has 25-30 radial spines, usually has 2 centrals, and pink flowers. Distribution: Near Hacienda de Tarajeas, Guanajuato. Mammillaria saetigera Boed. & Tiegel: has shorter axillary hairs (less than 2.5 cm long), radial spines 15-20, central spines 2. Outer perianth segments shortly ciliated. Stigma lobes pinkish-brown . Distribution: Queretraro (Arroyo Seco and Sierra de Jalpan). 5) Bárcenas Luna, R., Gómez-Hinostrosa, C., Guadalupe Martínez, J. & Sánchez , E. 2013. Mammillaria hahniana. The IUCN Red List of Threatened Species. Version 2015.1. <www.iucnredlist.org>. Downloaded on 01 June 2015. 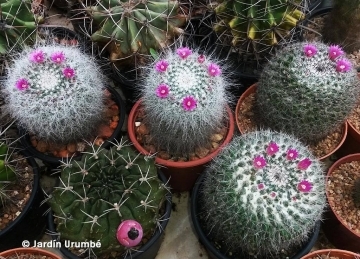 Cultivation and Propagation: It is a rapid growing species that will form large clumps rather rapidly when compared to other Mammillaria species. Needs lots and lots of space to grow. Water regularly in summer, but do not overwater (Rot prone) Use pot with good drainage and a very porous potting media, keep dry in winter. Feed with a high potassium fertilizer in summer. It is quite frost resistant if kept dry, hardy as low as -5° C (some reports give it hardy to -12°C) Outside full sun or afternoon shade, inside needs bright light, and some direct sun. Use and Trade: This cactus is used as an ornamental, and its fruit are eaten by humans. Propagation: Division, direct sow after last frost.